Ben 8's Story . . .
Update 05/01/2013: "Ben is eager to learn and anxious to please." Like so many young springers, Ben is a work in progress. With consistent, daily guidance in his foster home, his progress is showing nicely. Ben is still shy but is growing more confident every day. He is eager to learn and anxious to please. His family is working on his leash walking, a priceless skill for those at both ends of a leash. Ben knows to “sit” but is not sure whether he wants to surrender one of his four paws for a “shake.” With continuing encouragement and some yummy treats, this will come too. He “comes” most of the time………very sweet to see! For one so young, Ben is fairly laid-back. He’s content to curl up at your feet until you are ready to take him for a walk. There have been no further problems with his hip. Regular exercise seems to have resolved that concern. The steady, basic training that Ben is receiving now is a “down payment” on his future. His adopting family will need to contribute regularly when Ben passes into their care, as he’ll be “a work in progress” for some time to come. But, oh, what a payback for time invested…………a loyal, loving and well-mannered companion for a lifetime! Original: "Some basic training, a steady home life, and lots of love will boost Ben's self-confidence in a short time." When his elderly Delaware owner was unable to keep up with his care, Ben and his brother, Jerry, were surrendered to MAESSR. These boys were placed in separate foster homes so each could begin adjusting to life without the other. At 19 months old, Ben is now starting to overcome his youthful shyness. 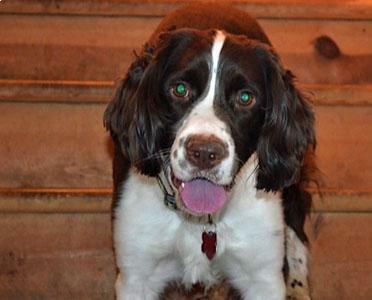 Ben is a typical Velcro Springer and follows his foster family from room to room. He is curious about all around him and stops to carefully exam everything he comes across. He runs everywhere rather than walks. It's believed that Ben did not get very much exercise in his former home but he's making up for it now with two walks and several romps in the yard daily. A crate is a comfort zone for Ben. He has the run of his foster household but will often enter his crate for some rest. He has had no accidents in the house and signals by pacing when it's time to go outside. If you open the door, he will go out, do his business and return to the door in a few minutes. How easy is that?! Ben is very gentle, very shy and likes to have his chin rubbed. It is not known how he would act with children but, once he got to know them, he would probably love their company and activity. Ben and the resident cat have met but their relationship is still unsettled. 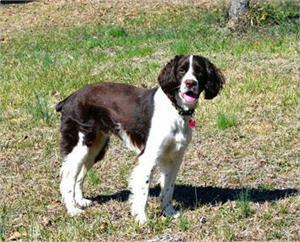 There have been no problems between Ben and the older resident female Springer besides a brief grumbling over food bowls. Ben is a slow eater and the resident female will eat whatever is available. With some oversight by the family, each dog is getting a full measure at mealtime. Ben has just returned from his visit to the vet for a check-up. He is in good health, slim and trim at 39 pounds. There is a slight hip concern which may be as simple as over exertion from exercise.............more to come as that issue is evaluated. He's also being prescribed an anxiety medication until he gets over his shyness. Some basic training, a steady home life, and lots of love will boost Ben's self-confidence in a short time. He's at a tender age, not yet an adult but no longer a little pup, when time invested can result in life-long gains. Keep an eye on this youngster...........he's got a ton of potential!